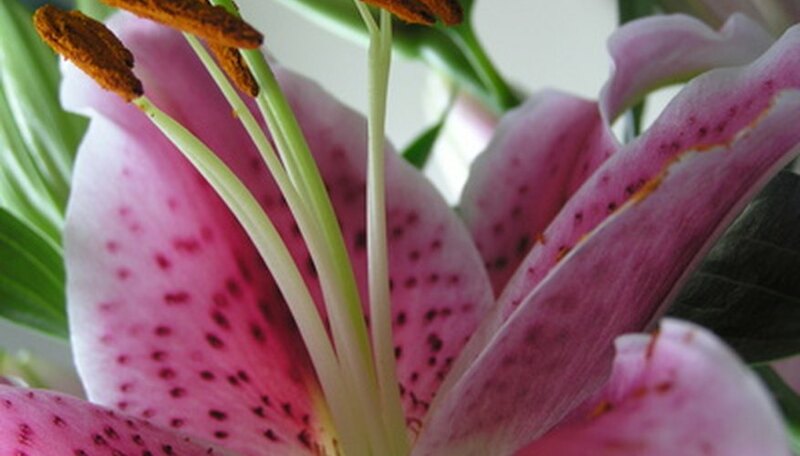 Oriental lilies are among the largest lilies, with the most fragrant blooms. Depending on the cultivator, oriental lilies can grow to reach a height of 6 feet. They bloom during the summer and make good companion plants to spring blooming plants, such as daffodils and tulips. Oriental lilies self propagate and typically overcrowd a garden in three years. At which time, digging them up, dividing the bulbs and transplanting the bulbs is necessary to keep your oriental lilies thriving. Prepare a spot to plant your transplanted oriental lilies, which prefer four or more hours of sunlight, afternoon shade and an area away from strong winds. Incorporate 3 to 4 inches of compost or peat moss to the top foot of your new planting site to improve drainage and add nutrients to the soil. If your soil is high in clay, also mix in 3 to 4 inches of coarse sand. Cut off the foliage after it yellows and dig the oriental lilies up in the fall, after the foliage dies. Alternatively, dig them up in the early spring, before they begin to sprout again. Divide the bulbs with your hands if there are bulb offsets attached to the main bulbs Plan to plant the smaller bulbs near the back of your garden since they may not bloom for the first year or two. Replant the divided bulbs 6 to 8 inches deep with the tips of the bulbs facing up and space them 12 to 15 inches apart. This will allow room for the oriental lilies to reach their mature growth, and the garden will not become over crowded in just a year or two. Water the newly transplanted bulbs with an inch of water. In the spring, continue to water about once a week during dry spells. In the fall, you generally don’t need to water them until the spring.